Nothing HR does contributes more to productivity than improving engagement and retention. Nothing supersedes the value of getting our employees to give their best and to stay. No administrative task like making payroll, no hiring task like filling jobs quickly, no program task like renting an ice cream machine for employee appreciation week. Nothing else we do. HR leaders know better than most that voluntary turnover is spiking and nearing its all-time high, that fewer than one-third of our employees are engaged in their work, and that executives say in survey after survey their number one concern is “talent.” Employees stay or leave – and engage or disengage – primarily based on their relationship with their manager. And that means their direct supervisor, the one they connect with – or don’t connect with – every day. So we need our executives to manage engagement and retention instead of us. We can coach them and play critical roles, but if CFOs read the financial data and HR distributes the turnover report, retention is already second-tier. • Convince their CEOs that engagement and retention are top-tier metrics as important as sales and service. • Replace those mysterious turnover percentages and engagement scores with dollar values that resonate with the CFO. • Train managers to conduct stay interviews because they bring proven solutions. • Ask leaders to forecast how long employees will stay and how many of their team will score high on the next engagement survey. 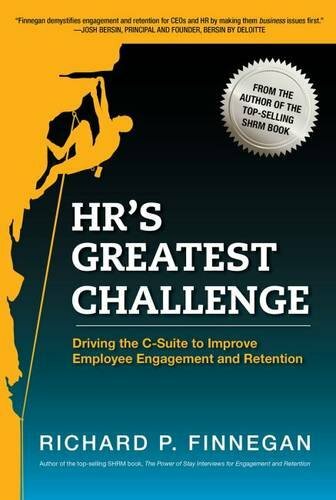 And most importantly, this book will help you solve employee engagement and retention as a business issue.